You’re on Birthday Wishes – Page 1 of 10 Birthday Wishes and Quotes. See menu at bottom of page. Birthday wishes, quotes and messages come easy for some people. But, for others, knowing what to say or write can be difficult. We’ve made it easy for you with this collection of birthday wishes, sayings and messages. If you ever been stuck with what to write on a friend’s card or Facebook page, you’ve come to the right place. Never be at a loss for words. Friends are always close at heart. I’m so glad we are friends. Happy Birthday! Wishing you all the best for today and in the future. Hope your birthday is just the beginning of a year full of happiness! May this birthday be just the beginning of a year filled with happy memories and wonderful moments. You may grow a year old every year, but I hope your spirit remains youthful. For your birthday, I wanted to get you the thing you need most but how do you gift-wrap a 25-hour day? Today is a gift of life, today it’s your birthday. The Best Birthday Wishes for my Bestie! Because you’re you, I’m celebrating today! Can you hear the skies whispering Happy Birthday in your ears? I can! Wishing you a super fun day! Wishing you a year of joy and friendship. No need to count your years, we all know you’re one year older than last year. We’re going to party like its your birthday! 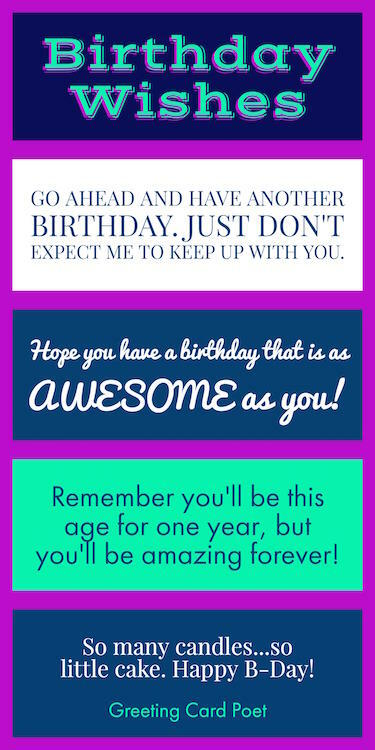 Great for Facebook Birthdays, texts and cards. HBD to someone who deserves a truly happy day. Sorry, I Can’t Pop Out Of Your Cake! Surround yourself with the laughter and love of those you hold dear today and everyday. Combine these Facebook Wishes with a visual of your friend or family member. A Facebook birthday wish can be short or long. Make it personal. Happy b-day, may this day always be a special one to remember. May your B-Day bring the best of everything! Here’s to another year full of experiences, joy, happiness, surprises and good luck. Have a smashing day! Here’s hoping that you have the most wonderful birthday ever. Check out our messages for occasions like anniversaries, weddings and more. Hope you have a birthday that is as cool as you. Hope your birthday wishes turn into lots of dreams come true! While your standard birthday reply that you get better with age like fine wine works, please come up with something new this year. I Hope These Brighten Your Day, As You Always Brighten Mine. May this special day bring you joy and happiness. Dear friends last a lifetime, so keep up your good health because I planning on living a long time! Instead of saying that I hope you will have many great things in life to come, I’d like to say that I know you have many great things to come in life. Have a great one! You are an amazing friend who deserves all the best on this day and every day! Wishing you special moments all day long! I’ve often wondered about my tough times, “How did I ever get through?” Then I realized it’s all because I had a friend like you. Have a wonderful day and thank you. All my love husband on your day to celebrate. Life is a journey so enjoy every mile. Happy birthday husband – you light up my life. May this year be the best of your life, until the next one. Hoping that this year will be your best ever – Love Mom. May your Birthday be filled with so many laughs that I can hear them through all the distance between us. Hoping your birthday be filled with sunshine and smiles, laughter, love, and cheer. May your birthday be so special that you find yourself smiling long after it’s over. I hope you have meaningful, fulfilled day! My biggest Birthday wish for you is that you should stay the way you are. Don’t ever change. Many happy returns of the day! On your Birthday today, may candles bring you the light of good fortune in your life. Wishing you all the best! One year older and a whole lot wiser. Birthday certificate templates – great for home and office. Chance, luck and opportunity will come and go. But I will always be here for you no matter what. Remember, you’ll be this age for only one year but you’ll be awesome forever. The best part about your Birthday is that we always end up getting good food and great cake. The first thing that came to my mind this morning was that today is your Birthday. There isn’t a sweeter person than you Here’s to the best day of your year. Today is not just the end of another year, it’s the beginning of a new one. Whatever your dreams, whether big or small, may this year be the year in which you have them all fulfilled. Wishing you the loveliest of birthdays. Yesterday is history, tomorrow is a mystery but today is a gift, that’s why it’s called a present. Enjoy your day! You have another 365 days of your life waiting to give you a roller coaster ride to take you from one destination of happiness to another. Have a great Birthday. Wishing you birthday memories to hold close to your heart! Have a Beautiful Day. For dad, father, pops are whatever you call him. Best wishes dads birthdays. You’re older today than yesterday but younger than tomorrow. Your birthday is truly an event worth celebrating! Enjoy! Dad, only the best birthday wishes on this day of days! Happy birthday Dad! Some folks don’t believe in super heroes, but they haven’t met my father. Always wishing I was more like you – have a grand day! You mean the world to me. Happy B-Day! You always encouraged us to chase our dreams, and now you have the chance to chase some of your own. To the man who taught me how to throw a ball, bait a hook and enjoy life. I love you Dad! Dads birthdays are always the best – because you don’t have to shop as you already own everything. A happy dad = happy wife and happy kids. Thanks for making our lives so great. You’re older today than yesterday but younger than tomorrow, Happy b-day! Another candle on your cake? Don’t pout. Be glad that you still have the strength to blow the things out. Celebrate your birthday! Take TWO naps. Forget your past, it’s already done. Forget your present too because I forgot. I used to think that I was good at math, but then I tried counting your candles. It’s ok to light the candles on your birthday cake now; I’ve already alerted the fire department. Roses Are Red, Violets Are Blue, AARP is looking for you. You’re older, wiser and too mature to be concerned with material things, like presents. Check out our Birthday Puns and Memes. 29 again? Talk about recycling! A very Happy Birthday to a person who is good-looking, intelligent and someone who reminds of myself! I hope you have a great one. After all, you are old now! Another birthday? Before you start feeling old and depressed, just keep this in mind: I have pantyhose older than you! Another year, another new ache. Better to be over the hill than burried under it. Wishing you the happiest of days. Birthdays are nature’s way of telling us to eat more cake and throw a party. Enjoy your day! Can you blow out all these candles or should I call the fire department? Can you guess what I want to be when I grow up? As much fun as you! Congratulations on turning another year older and still looking like a teenager. Don’t do anything embarrassing on your birthday this year. You don’t have as much time to live it down as you used to. Don’t think of it as getting older, think of it as becoming a classic. May your birthday be happy Sis – you deserve it! Don’t worry sister, you’re not getting older you are getting more like mom. To The World’s Best Mother, Daughter, Sister & Friend. Happy Birthday Sis – you’re one of a kind and that’s what I love about you. For your birthday you get another year of me being impolite, annoying and ungrateful towards you. Wishing you all the best. Friends may come and go, but birthdays just accumulate. Happy Birthday my friend who in dog years would by now be…uh-oh dead! Ha ha. Enjoy your day! On your very special day, I hope that you don’t die before we eat your cake. To a man who is really younger than he looks. And, to a not-so-old oldtimer. For a person who is smart, good looking and funny and reminds me a lot of myself. To someone who still looks good. In fact, almost lifelike. Scientific studies have almost proven that cake is calorie free on your birthday. So enjoy. That piece of cake is loaded with fat and calories which could, theoretically, take years off your life. If you don’t want it, can I have it? You’re one year closer to your death day. Here’s to the future and many more candles to come. What’s your secret, a time machine or something? Happy Birthday. You’ve got a great life, you look wonderful, and your health is good. How could a measly present from me compete with that? Here is a short and simple birthday wish. Have a sensational day! Hoping that you can find all the strength and courage needed… to blow all of the candles out. Some say the glass is half empty. Others say the glass is half full. It’s your birthday, so just drink what ever is in the glass. How do you plan to celebrate the milestone that makes you closer to old age and death? Have a superb Birthday. I always forget to get the gifts but I’m always there when you cut the cake. Have a great day my friend. I can’t believe that you are turning another year older. It seems like just yesterday we were the same age. I wouldn’t say that you are old; you’ve just been around longer than most of us. If I’d known that you were going to live this long, I would never have given you that expensive gift last year. Beautiful birthday wishes from just one of your lifelong admirers. I’ll always think of you as someone older than me. Let’s share a birthday hug right now… before you realize that there’s no gift for you. Money’s tight. Times are hard. Here’s your friggin’ birthday card! On this birthday I wish that you have a young life by living honestly, eating slowly and learning to lie about your age. Happy Birthday! Since today is your Birthday, we’ll make sure that we behave. As long as you’ll give us cake. Wishing yo the best birthday ever! Happy birthdays moms! Make your Mom happy on her birthday with one of these selections. Hope your happy Mom on your celebration day. Thanks for inviting us all to come celebrate your birthday!! Hope the cake is good, All the best. The best way to enjoy your Birthday each year is to keep getting more gifts but never remember your age. The first mark of aging appears when you start forgetting things. In your case there are no such problems. There were a lot of famous people born on your birthday. Too bad you aren’t one. Mom birthday time is here. It’s a celebration! God created you for a special purpose. Happy Birthday! Wishing you awesome years of joy and success ahead. You’ve survived another year. Although you’re older, it sure doesn’t show. Congratulations. Two things in the world that come to you without any reason are blood pressure and age. You’d rather prefer the latter than the former! Two tips on your birthday: 1) Forget the past you can’t change it 2) Forget the present, I didn’t get you one. Want to know how to keep an old guy in suspense on his birthday? I’ll tell you later. Wanted to send you something really nice for your birthday but the machine just kept taking my quarters. When a tree gets a year older, it makes a growth ring by adding another layer of tissue around its girth. Boy, does that sound familiar. You’re having a birthday! Well, I think I speak for everyone in the office when I say Hope this means snacks! Birthday Wishes for You: Have an Awesome Day! You know you’re getting old when you walk up the stairs and call it exercise. Happy Bday! No one loved birthday celebrations as much as you – so enjoy! You know you’re grown up when you stop growing tall and start growing wide. Hoping all of your birthday wishes come thru – well, all except one, so you have something to shoot for next year. You think you are old? You’re not old… you were old last year, this year you’re ancient. You’re not getting older. You’re just a little closer to dying! You age like cheese. Yes, you just keep getting smellier! Every year on your birthday you get to start new. It is lovely, when I forget all birthdays, including my own, to find that someone remembers me. Our birthdays are the feathers in the broad wing of time. The greatest gift you can give others is the gift of unconditional love and acceptance. I hope your big day was all that you hoped for. Wishing you all the best – just a little late. I’m so lucky to have such a great friend like you… who’d forgive me if I forgot his(/her) birthday. It feels like you just had a birthday the other day. Oh yeah, sorry I am late. My best wishes to you, even though are belated. Forgetting a Birthday doesn’t mean you forget a person. And remembering a Birthday doesn’t mean you remember the person. Here’s a genuine Belated Happy Birthday wish from me. I am sorry, I missed your birthday. But my wishes are always with you. Sorry I forgot your Birthday. I hope you had a grand and special celebration with your loved ones and friends. You are fun and fabulous. You are fabulous fun. Even if I am a bit late is saying so. Hope it was a fun birthday. Silly me. I missed your birthday. What was I thinking. Hope it was fun. Hope your Birthday was happy and totally great. Have a wonderful year! Oh no! I forgot your special day! I’m so sorry dear. But I hope that your birthday was indeed a very special day for you. Belated Happy Birthday to you. I wish you have a fabulous year ahead. You are not just one more year older but one more year wiser! I missed wishing you on the big day and I missed out on the celebrations too! Let’s celebrate again and raise a toast to the Birthday of a fantastic individual and a genuine human being. You live life in the fast lane but I move a little slower. That is why I am a little behind you on celebrating your birthday. I wanted to be the first one to wish you, but I couldn’t! I deeply regret that! Hope you had one of the best birthdays this year. Belated Happy Birthday to a very special person. May God bless you! I hope you had a day filled with laughter, fun and frolic because a special person like you deserves the best on your birthday! Don’t think of these birthday wishes as being late, rather, extremely early for your next celebration. A belated birthday wish that your life will continue to be filled with the happiness you deserve. Double kisses and double hugs are your bonus gift to make up for being late to wish you the best. Happy Belated Birthday. When things get busy, time slips by, but birthdays never wait. So finally when we send our greetings, they may be just a little late. But when it is someone so special that we like a lot, our thoughts are always on time, it is just our greeting that is not. Sorry I forgot your birthday, my memory gets worst year after year. I think you understand what I’m talking about. Your birthday came and went Here’s the card I should have sent. I didn’t really forget your special day, I just figured you deserved more than one. The bad news is that I forgot to wish you a happy birthday on time. The good news is I forgot your age. Sorry I missed your birthday. I swear that this only happens to me like once a year. Happy belated birthday to someone who now has free reign to forget mine. Knowing how much fun you can be, I assume that the party is still going and that I am not late for your birthday. Keep on having fun. A late birthday card is a lot like a bill from the doctor. Both tell you that you are getting older and both are a big surprise. I hear you’re celebrating a belated birthday,but all the other fools sent them on time! Don’t hate me because I forgot your birthday. Hate me because I’m beautiful. I wanted to give you your birthday card late so that you would have enough time to grieve the loss of your youth. Just because I missed your birthday doesn’t mean that you don’t look like a monkey. Hope you had a barrel of fun. I truly regret not eating cake on your birthday so I plan to eat 2 desserts today to make up for it. Birthday cards are like a group of high school P.E. class students running on a track. There are always some stragglers, and I’m the fat kid who smokes. Time seems to speed up the older you get, so at your age, I figured you wouldn’t even notice the time that went between your birthday and getting your card. I can be wrong, I can be crazy, but I can’t be too late in wishing you a happy birthday. My forgetting to give you your birthday card on time is proof that you are growing up way too fast. I am late wishing you a Happy Birthday because I was worried that you would still be in your birthday suit. I know you must be bugged because I missed your birthday. But I didn’t really forget it. I just didn’t want to remind you that you are growing old! Belated Happy Birthday anyway. I’m sure you had a blast! I could have sent you a birthday greeting on your birthday and I could have started Google, but I didn’t. You are happy with Google so why not be happy with me being a little tardy in saying Happy Birthday! I cannot describe what you mean to me. You are the most beautiful and the most talented person on earth. Hope that makes you forgive me or else I can still do better. Just kidding, Belated Happy Bday. Houston, we have a problem. I spaced out and forgot your birthday. Was it out of this world? It took me so long to write in your birthday card that I now have the perfect thing to say… Sorry I’m late, and happy belated birthday. I thought that you wouldn’t celebrate your birthday after you turned 29. I guess I counted wrong and you are 29 this year. Sorry I am late. Happy Birthday. My dog ate your birthday card, that is why this Happy Birthday wish is a little late. I would tell you the super-secret reason that I am late wishing you a Happy Birthday, but it is classified information and is available only on A NEED TO KNOW basis. Where does the time go? Another year passed before I could get your birthday greeting out. Do you have any ideas for birthday wishes that we missed? Suggest one or more via the Contact page. Thanks. Birthday for a friend? Check out our list of Friendship Quotes. Also, check out our Quotes on Friends.